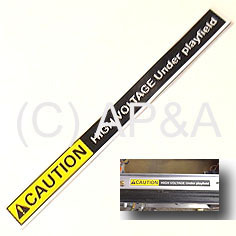 This nice looking warning decal mounts on the latch under the front glass lockdown bar on Bally and Williams games, approx. 1990 and up. Can be used on earlier models and other makes as well. Measures approx. 6 inches by 5/8 inch. Easy to install- just peel and stick! Nice finishing touch to a nicely restored game, or great for replacing old stained, worn, or missing decal on any game.